Students need many different activities to develop a conceptual understanding of our base-ten number system. 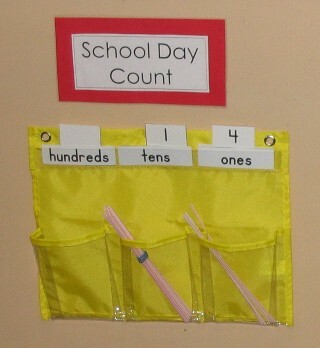 In the early grades, students often represent the school day or the day of the month by adding another straw each day. Students count the straws and determine if they can make a group or bundle of 10 to move to the tens pocket. Students then write the correct numerals to mark how many single straws (ones) and how many bundles (groups of ten straws) they have. Recording this on a place value chart with the straws helps students develop meaning for place value. In fact, in classrooms that practice this school day count routine, it is not uncommon to hear students make the unsolicited observation that "tomorrow is a bundle day." Regrouping ten bundles into one bunch of 100 straws is cause for celebration in a primary classroom. This is clearly an important part of every 100th day celebration. Read more about morning routines in the primary classroom and how these practices contribute to students' conceptual development of place value. Games provide extended place value practice for students and allow them to use their conceptual understanding to develop appropriate strategies to win the game. The best games encourage students to try out many options in search of the best solution. This search for the best solution prompts additional practice in a highly-motivational setting. Students use number cards to create the largest number possible. 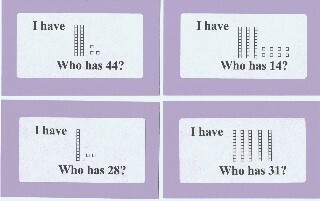 Deck of digit cards for each set of partners (2-4 each of #0-9, depending on the level of students and the size of the numbers they will create) Note: Spinners with #0-9 may be used instead of cards, if desired. Partner A turns over the first card and decides where to place that card on his/her place value mat. Once the card is placed, it may not be moved. Partner B turns over a card and decides where to place that card on his/her place value mat. Again, the card may not be moved once it is placed. Play continues with each partner turning over a card and deciding where to place it on the place value mat in hopes of building the largest number. When all slots are filled on the place value mats, partners compare numbers to see who created the larger number. That partner wins a point for the round. 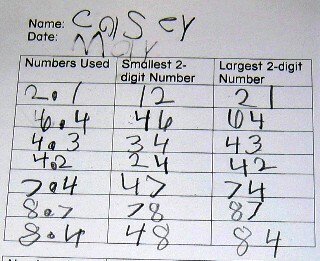 Partners record both numbers on their recording sheet and circle the larger number. Students clear their mats, shuffle the cards and play additional rounds, as time allows. Students try to form the smallest number. Students try to form a number that is less than 1000.
Who Has? 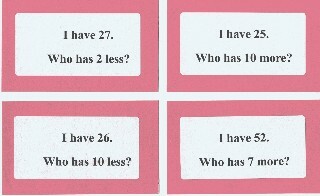 More or Less: this activity builds on students' conceptual sense of place value as they mentally add or subtract one-digit numbers or multiples of 10. 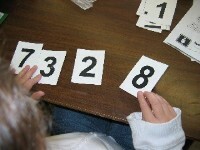 The deck is designed to provide practice in extended addition and subtraction facts by including these multiples of 10. The deck could be extended to provide practice for 3- or 4-digit numbers by adding or subtracting multiples of 100 or multiples of 1000.
Who Has? Base Ten: this activity is designed for students in Grades 1-2 to practice place value by associating the base-ten block representation of two-digit numbers with the digits. This activity is meant to follow and complement the use of the base-ten blocks in mathematical instruction not to replace students' use of these manipulatives.